BOSTON, MA - MAY 15: Marcus Smart #36 of the Boston Celtics defends against Otto Porter Jr. #22 of the Washington Wizards during Game Seven of the NBA Eastern Conference Semi-Finals at TD Garden on May 15, 2017 in Boston, Massachusetts. Isaiah Thomas scored 29 points and had 12 assists, Kelly Olynyk scored a career-playoff high 26 points and the Boston Celtics used a big fourth quarter to outlast the Washington Wizards 115-105 in Game 7 of the Eastern Conference semifinals Monday night. "What a special opportunity to get a chance to compete against them," Boston coach Brad Stevens said. 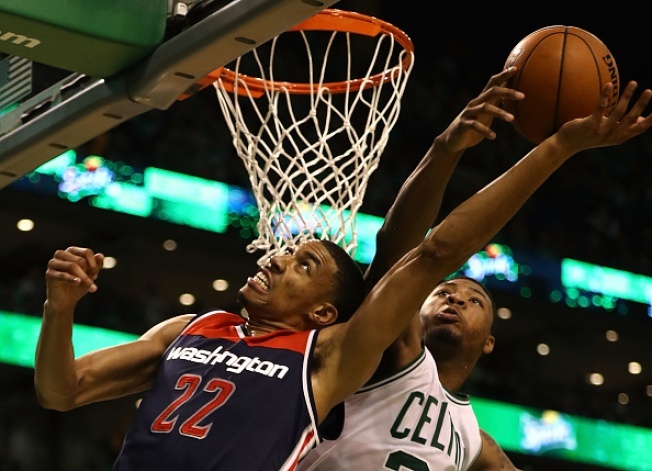 Led by Olynyk the Celtics got a huge lift from their bench, outscoring their Wizards' counterparts 48-5. Boston also connected on 11 3-pointers, including 8 of 13 in the second half. "Everyone gave their best tonight and it turned out well," Olynyk said. "It was a team effort, hard work. It was a tough seven-game series. Both teams played hard, we outlasted them there. They are a great team. They made big shots all series." Otto Porter added 20 points. John Wall and Markieff Morris each finished with 18. But Washington also had 15 turnovers, leading to 17 Celtics' points. Boston trailed 76-72 late in the third quarter before ending the period on a 13-3 spurt. The run grew to 22-5 in the opening minutes of the fourth as the Celtics' lead became 94-81. "I knew it would come down to the last six minutes of the game," Washington coach Scott Brooks said. "They had that little run at the start of the fourth quarter." Marcus Smart, Amir Johnson and Olynyk all were whistled for three fouls in the opening 24 minutes, though Smart did inject some life into a second unit that outscored their Wizards' counterparts 19-5. Wizards: Dropped to 6-5 all-time in Game 7s. ... Still have not reached a conference final since 1979. ... Outrebounded the Celtics 43-31. Celtics: Improved to 22-8 all-time in Game 7s and 19-4 all-time at home. ...Outscored the Wizards 58-40 in the paint. ... Lost season series to Cleveland 3-1.